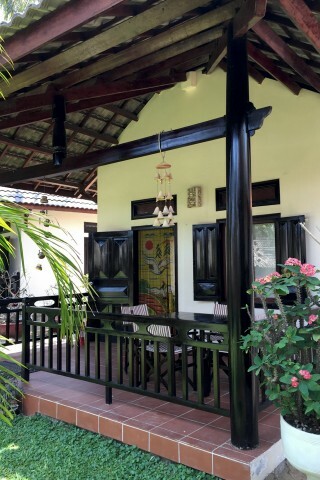 If you dream of having your own comfortable cottage in a palm dotted garden with a big pool, it exists in Mui Ne: look no further than Thuy Thuy Cottages. Ad Book now! Rates from US$73.87++. Average rating 8.1 from 16 reviews. Situated on the non-ocean side of the road, the 10 cottages are charming, tidy and well maintained. Each one has a private terrace with a patio set, which adds to the difficulty of deciding where to hang out. The garden has huts with cushy sofas and frilly white hammocks strung between palms, plus don’t forget the many sun loungers around the good sized pool. Decisions, decisions. Inside each freestanding bungalow is an inviting, playful space with terracotta tile floor underfoot, bamboo furniture with cushions, white linens and white walls jazzed up with bright curtains and colourful art. Windows also let in plenty of natural light. Attention has been paid to the little details such as bedside table, lamp and plugs, and you get a fridge, air-con, TV and WiFi. The bathrooms are spacious and come with a separate shower stall with two types of showerheads. Thuy Thuy has a central location on the strip, across the road from Mui Ne Backpackers Resort and a short walk to some beach area. It boasts better service and more amenities than some of the so-called “resorts” in Mui Ne: a restaurant pavilion, gym, steam room and foosball table – and friendly service to boot. It’s an absolute winner for travellers on a mid-range budget, or families as there’s green space for kids to run around.